Hot off the pliers, brand new jewellery creations just in time for Christmas and other Holiday celebrations! Daniel Swarovski was an Austrian glass cutter and jeweller born in Bohemia. In 1892 he patented an electric cutting machine that facilitated the production of lead crystal glass jewelry, enabling him to cut crystals with the outmost precision. 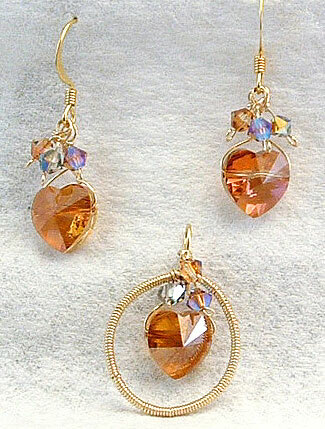 Swarovski crystal contains approximately 32% lead to maximize refraction. The Swarovski Crystal range includes crystal sculptures and miniatures, jewelry and couture, home decor and chandeliers. In order to create a crystal that allows light to refract in a rainbow spectrum, Swarovski coats some of its crystals with special metallic chemical coatings. Aurora Borealis, or “AB”, is one of the most popular coatings, and gives the surface a rainbow oil slick appearance. Other coatings include Crystal Transmission, Volcano, Aurum, and Dorado. Coatings may be applied to only part of an object; others are coated twice, and thus are designated AB 2X, Dorado 2X etc. The company also sells beads and rhinestones, encouraging other manufacturers, artists and consumers to create their own designs. In 2007 Swarovski also launched the product brand website crystallized.com which provides information for designers and manufacturers in the worlds of fashion, jewellery, accessories and interiors. CRYSTALLIZED™ – Swarovski Elements is the new product brand for Swarovski crystals which come in a variety of sizes, shapes and colours. Products that are labelled with this brand guarantee the originality of Swarovski crystals used in creations of international fashion houses and designers. To see or purchase some of the jewelry I have created from these marvelous crystals, please visit my web store: Wrapped to Go! 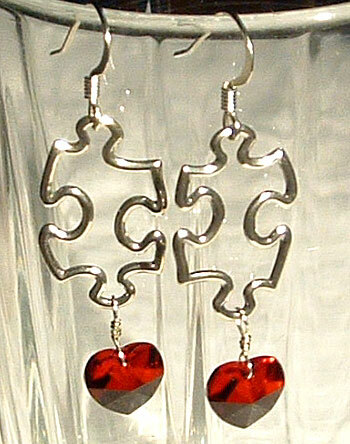 Beautiful Sterling Silver Puzzle piece earring enhanced with a genuine Swarovski crystal heart. These lovely earrings ( which are also the symbol for Autism Awareness) measure about 1 1/2″ from the bottom of the Sterling Silver earwires. Please visit my web-store: Wrapped to Go! 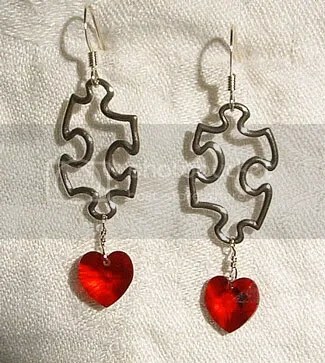 to purchase these special earrings! Paypal and Money Orders accepted.